Within the InLoox options you can individually edit the project number. The options define the project number format. For more information see Change the number format. 2. Select General Options and click on Project Number. 3. 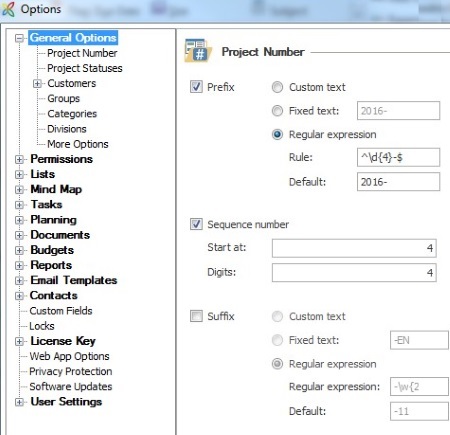 Individually edit the project number by using one of the three options or combining them. Prefix = Project number is displayed as a preceding character string. Sequence number = Project number is automatically continued. Suffix = Project number is displayed as a following character string. 4. Click on OK or Apply to save your changes. Any changeable character string of any length. Any character string of any length, which cannot be changed, e.g. the word project-. To define the format of the project number insert a Regular expression and a Default. "2016-" (fixed prefix with year). Adjust the project number in InLoox 9 • Copyright 1999-2019 © InLoox, Inc. All rights reserved.